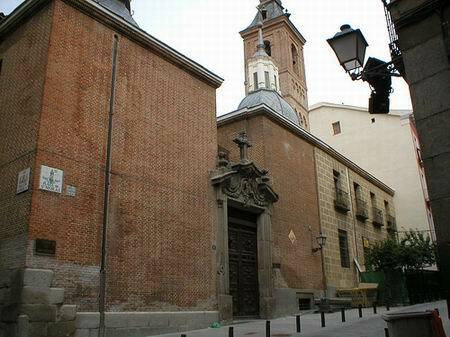 The Church of San Nicolás de los Servitas is also know as La Iglesia de San Nicolás de Bari and is located at 1 Plaza San Nicolás in Madrid. The church is the oldest in the city, and was first mentioned in a publication in 1202, the "Fuero de Madrid", which determined local laws and regulations. The oldest part of the structure is the bell tower, which, although it has undergone a degree of renovation, still retains its distinctive Moorish Mudéjar style. The bell tower was built in the 12th century, probably by Muslim Moors who were under Christian rule, following the reconquest of Madrid, which took place in 1085. While debated by some, it is possible that the bell tower was once part of a Moorish Mosque, though there seems little way to determine that for certain. The horseshoe arches and lobe on the tower could have been the minaret of a Mosque. While the bell tower may not have been built by actual Moorish craftsmen, it was definitely built by craftsmen who were very familiar and comfortable working in the Moorish Arabic Mudéjar style. The rest of the church was generally reconstructed to its present day design in the 15th century and even later. Known as Madrid's Italian church, the Church of San Nicolás de los Servitas will perform mass in Italian on occasion. A big enough group of Italian speakers are required to be there for that to happen, and they must request it first, of course. The exterior of the church is striking in its detail of ceramic columns propping up arcades. The impressive coffered ceilings inside the small church is also very much worth seeing. Some claim them to be the best in Madrid. There are also sculptures and paintings by Pedro de Mena, Salvatierra and Nicolas de Busy inside the chapel. The early history of Madrid from the Islamic point of view is also told through exhibits inside the small chapel. The Church of San Nicolás de los Servitas is served by Metro Opera a short distance to the north, and by Metro La Latina further away to the south. It is located a short walking distance from Madrid's Royal Palace. The exact location may be seen on our tourist map. The church is open between the hours of 8.30am and 9.30am, and 5.30pm and 8.30pm on Mondays, as well as between 6.30am and 8.30pm on Tuesdays to Saturdays. On Sundays it is open between the hours of 10am and 1.30pm, and again between 6.30pm and 8.30pm. Entry into the little church is free, though donations are gratefully received. There is no air conditioning, but the church is usually pleasantly cool, even on the hottest of days.